PSP Photonics Letters of Poland (ISSN 2080-2242) is a new peer-reviewed web-based, open-access journal published by the Photonics Society of Poland and co-sponsored by SPIE. Journal is also supported by the Ministry of Science and Higher Education of Poland in the frame of the project 699/P-DUN/2017. The Photonics Letters of Poland is indexed in major scientific databases, including Scopus and Web of Science Emerging Sources Citation Index. The journal covers the topical areas of optics, optoelectronics and photonics in the following aspects: fundamental and applied research, physics and technical, materials, components and devices, circuits and systems, technological and design, construction and manufacturing, and metrologic. 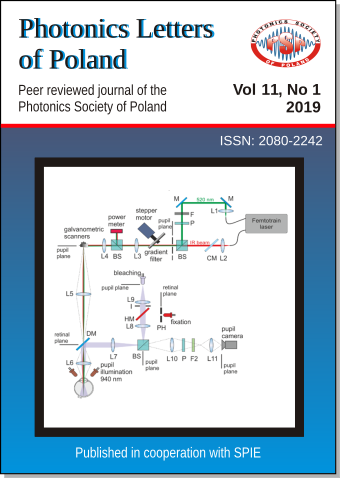 Photonics Society of Poland encourages the prospective Authors to publish the results of their research and technical work in the new, peer reviewed, rapid Internet journal Photonics Letters of Poland. The Advisory Board of the Photonics Letters of Poland is composed of Polish researchers active in optics and photonics, whereas the International Advisory Board groups prominent international experts and scientists in the field.